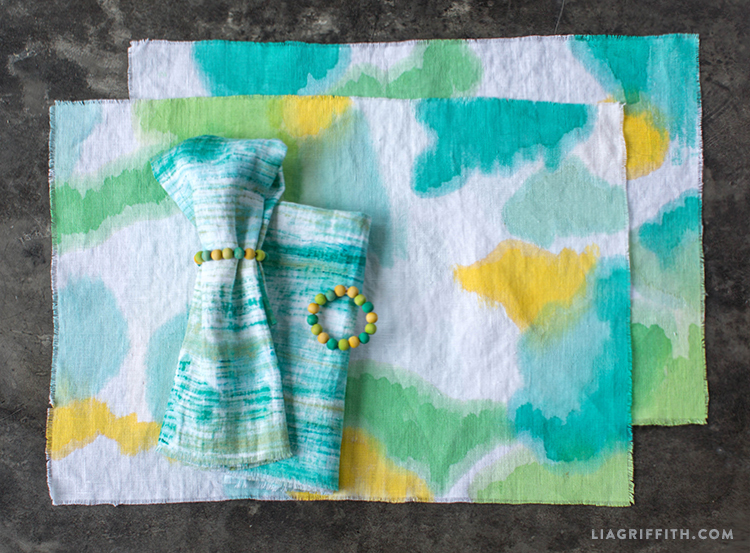 We’ve been on a bit of a fabric dye kick with our DIY home decor projects in celebration of spring. Light fabrics and bright colors are the perfect combo for sunny days! Warmer weather always puts us in the mood to host more gatherings, so we have been focusing on easy DIY table setting accessories that you can use for your next dinner party. 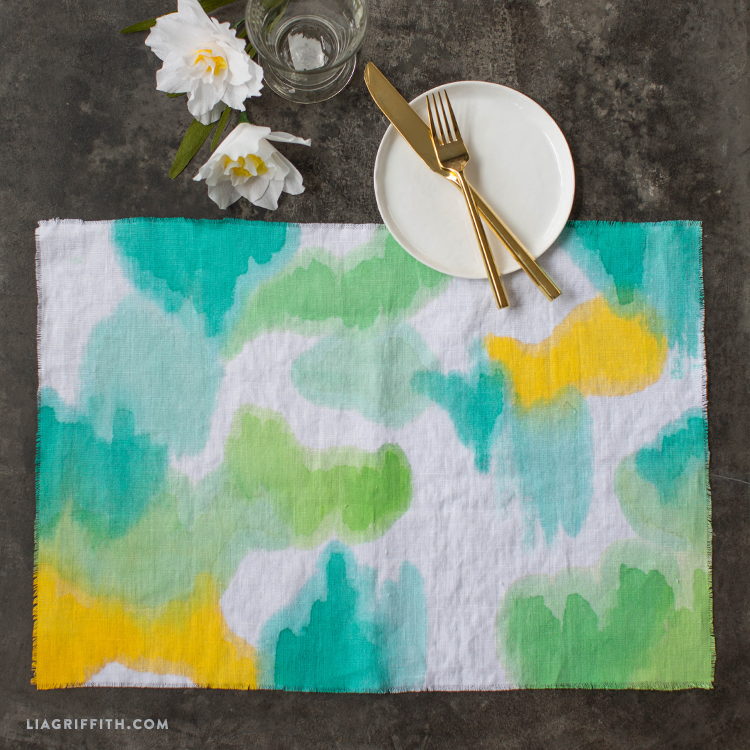 First we shared painted linen napkins, wooden bead napkin rings and now these fresh and funky painted linen placemats to match. Gather the tools and materials listed above. 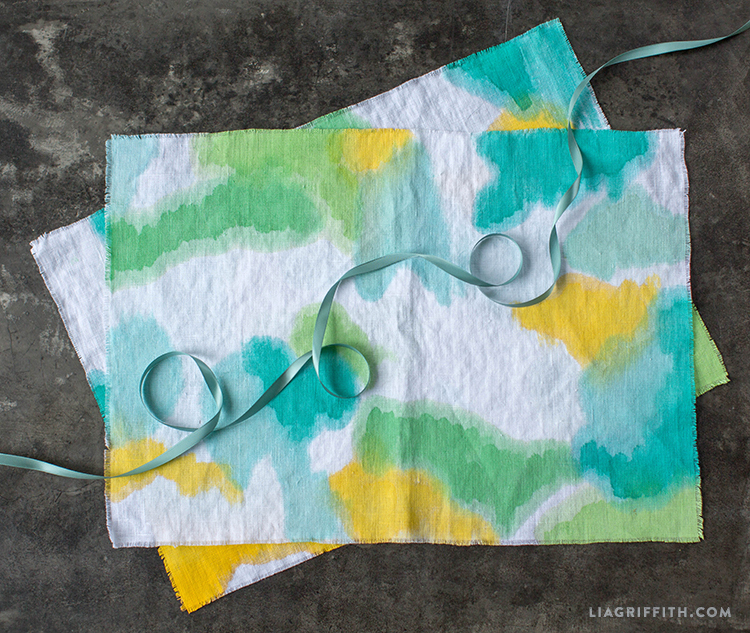 Pre-wash your linen and cut into 14 x 20″ rectangles. 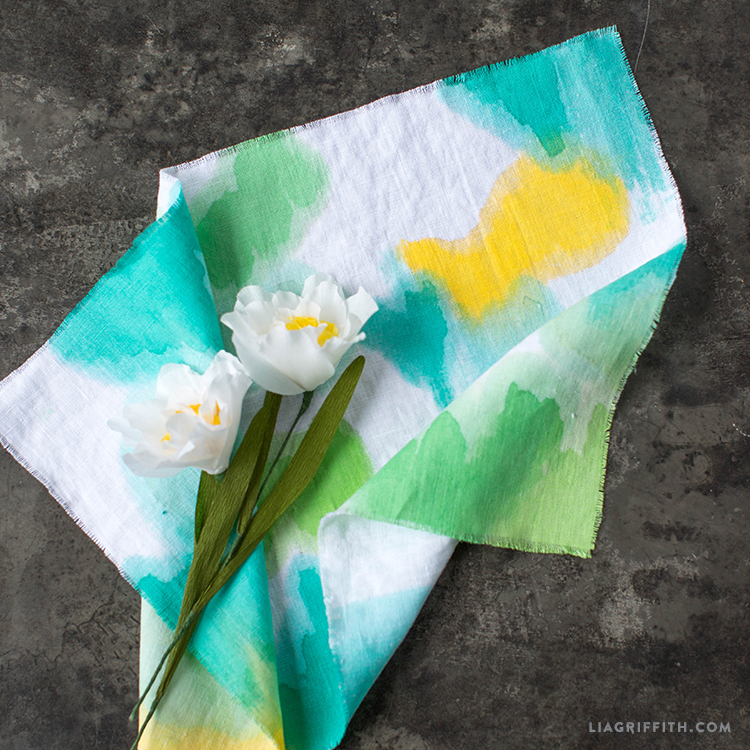 Refer to our frayed linen napkins tutorial for instructions on cutting linen. Dissolve fabric paint in a small amount of water and blot it onto the linen using the sponge brush. Experiment with varying amounts of water to create different shades of the same color of paint. Add splotches of additional colors, covering the fabric while leaving some areas of white. The paint will bleed at the edges and the colors will mix, creating the watercolor effect. Allow to dry and iron to set, according to the fabric paint instructions. 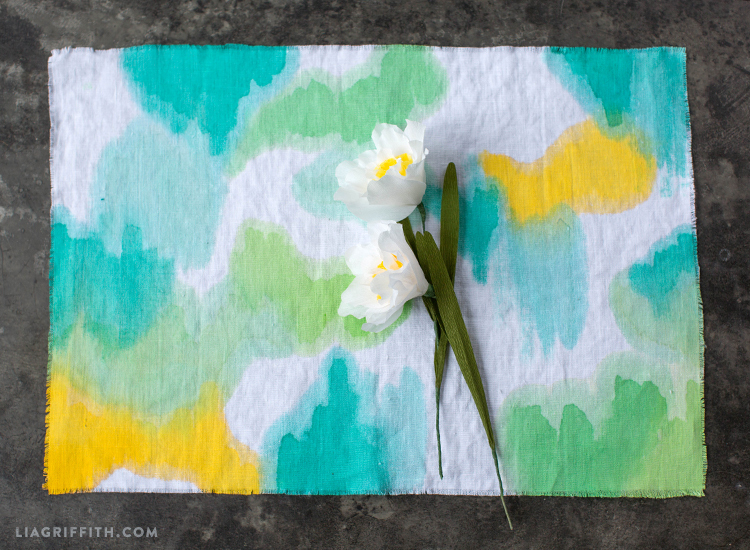 This painted linen placemats projects is super easy and a lot of fun! 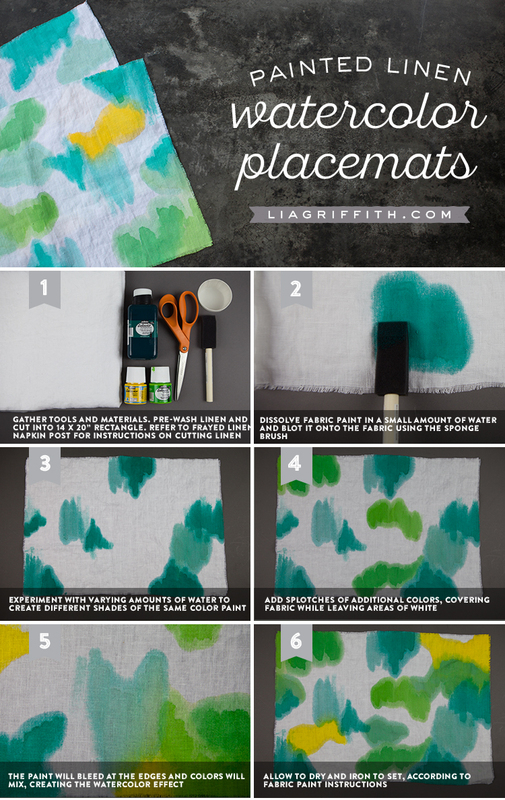 We love the idea of creating your own abstract expressionist painting on something as simple as a DIY placemat. 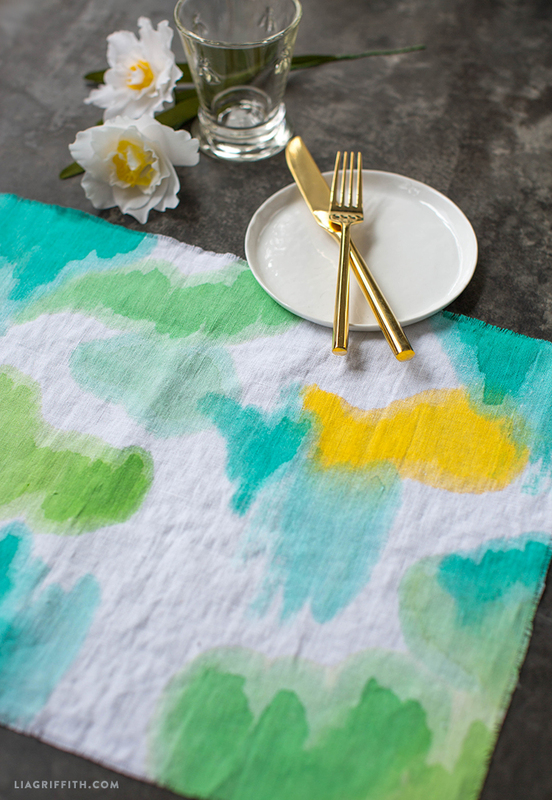 If you have an old white t-shirt laying around, we recommend using it to practice with variations in the paint and creating a specific design that you want to put on your placemats. There is no need to hem the edges of the linen, so it really is just like a canvas that is ready to display once you add the paint.